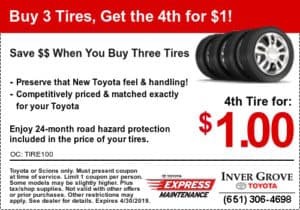 Nobody likes to buy more parts – that’s why Inver Grove Toyota shares valuable parts coupons and discounts with our customers. 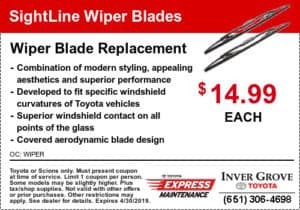 Save more, get more info, share with a friend or print coupons for your next visit to Inver Grove Toyota! 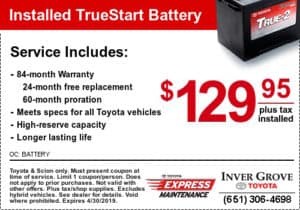 – Preserve that New Toyota feel & handling! Toyota or Scions only. Must present coupon at time of service. Limit 1 coupon per person. Some models may be slightly higher. Plus tax/shop supplies. Not valid with other offers or prior purchases. Other restrictions may apply. See dealer for details. Expires 4/30/2019. Toyota & Scion only. Must present coupon at time of service. Limit 1 coupon/person. Does not apply to prior purchases. Not valid with other offers. Plus tax/shop supplies. Excludes hybrid vehicles. See dealer for details. Void where prohibited. Expires 4/30/2019. On all OEM factory accessories in stock, plus tax and shop supplies. Installation Extra. Not valid on after market items.